My quest for He-Man and the Masters of the Universe figures. When I was a kid I went to a K-mart store with my best friend. I was in the toy section, and I saw a He-Man figure out of the package sitting on the shelf. I picked up the toy not knowing what it was. I thought, "This guy is so cool looking, I have to show my friend." I found my friend and said, "Man, this is the coolest toy I’ve ever seen! Mike, check it out." To my surprise he knew the guy’s name. "It’s He-Man, he’s lame. Look at these Zoids. Now these are cool. ", he said. I was talked out of buying a He-Man figure that day and bought some Zoids instead. Little did I know it would be almost 2 years before I would own any of these way cool Masters of the Universe toys. During these two years, we never had enough money to get any figures, and I would see other kids with these cool He-Man figures. Then I saw the cartoon, He-Man and the Masters of the Universe, and oh man, I had to get these, but I knew my mom could not afford them. At this time I also wanted a computer, and I had a Commodore Vic 20 on my radar screen, but my mom could not afford this either. So I asked everyone I knew to just give me money for my birthday and Christmas, for the computer. Only my dad took me seriously enough to send money, he sent up $100, and man, that was a lot of money for a kid. But nobody else gave any, and the Vic 20 computer was $300. So I was still a long way off. One night when we went out to eat, down the street from the restaurant was a department store, so I asked my mom if I could go to it, since I was finished eating. I walked into the store, and immediately found in the toy section, some Castle Grayskull play sets and lots of different (and wonderful) figures were for sale. I added it up in my head and calculated that I could get about 16 figures or a Castle Grayskull and 8 figures, with my $100. I had to make a tough decision that night. Buy the figures tonight, or save money for a computer that I only had 1/3 of the money for. I tell you, that was a very hard choice for me. I chose the computer. I got a newspaper route and saved that money up until I had the full $300 for the computer , then I dropped the route, bought the computer and thus changed my course in life. I still desperately wanted these Masters of the universe Figures. But there was no way to get them. My paper route was gone, and my mom had no extra money. One day I even saw some kids break a Masters of the Universe figure on the road, just for fun. A car ran over it and the plastic torso was broken apart. I could not believe this; this kid had these wonderful toys and treated them like this, when I could not even afford one. About a year later my mom had to leave her husband (not my dad) in a rush, and I had to grab all my things that would fit into one laundry basket (my clothes, Vic 20, some Micronauts, and a few books.) She took what money she had, and she said, today you can buy what ever you want. We went to Fred Myers and I found the toy section, then the figure isle, and looked for He-Man. All they had was Skeletor, Beast-Man, and Faker. I bought a muscle bound, blue skinned, skull faced, Skeletor. As times got better I got a batch of figures; Tri-Klops, Zodac, Ram-Man, Mer-Man, Zoar, and Screech. One time I spent money that I was supposed to use for my sister’s Christmas present on a Battle Armor He-Man. (Finally I got a He-Man!) Another time I was sick and slept off and on for 3 days and my mom woke me and asked me if there was anything I wanted, I asked for Man-E-Faces and Man-At-Arms. She got them for me then I woke up and played for hours. Soon I had a small job, and I was getting a new action figure every month, it was cool. 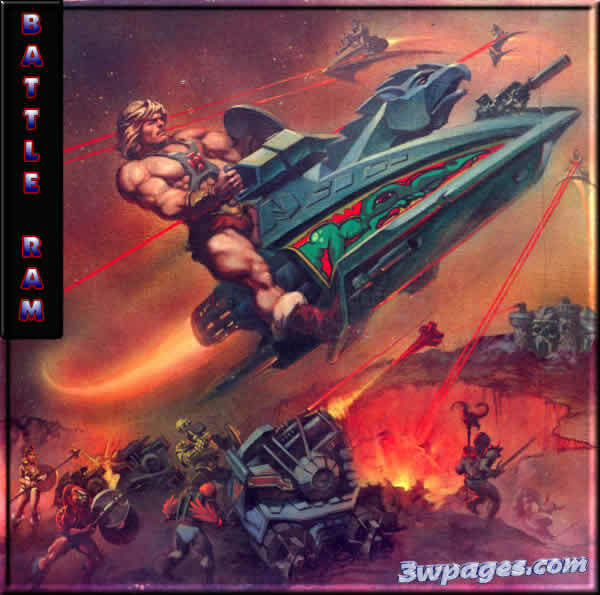 Beast man, Fisto, Jitsu, Mega-Blaster, the Battle-Ram (very cool vehicle, see the box art above that blew me away when I was a kid), Trap jaw, Teela, Evil-Lyn, Buzz-off and Webstor were among the ones I bought. Years later I started to have my own kids and went to second hand stores and found some old He-Man and the Masters of the Universe figures for them. I never told them the real names of the figures, we just called them muscle guys, and I would help my kids name their figures, usually named after guys I knew at work. Here is an example of the type of names my kids came up with; for the Jitsu figure, they named him Million Dollar Hand. Now again, years later, I am still trying to buy figures, but now it’s the new ones. I also bought all the commemorative ones in 2000 and 2001. My youngest of four kids calls them stupid He-Man figures. He doesn’t get it; he likes Teenage Mutant Ninja Turtles. She didn’t know what was inside, I asked if they (the he-store) could write Happy Birthday on the outside of the Box (they did, cool). She guessed all kinds of thing that it could be. At first she didn’t want to open her, in fear that it cost me an arm and a leg, I told her just open it. She was hesitant but then ripped into it.. She loved it. Well anyway we went to go see it on the big screen on a Saturday after noon. It was great, we were the only people in the theater. Since then my kids have all grown up, I have 3 Grand-daughters now, my oldest grand daughter (7 years old) loves She-Ra and plays with the MOTUC Princess of power figures. I made her a special one of a kind custom She-Ra.